If you read yesterday’s post on The Merry Adventures of Robin Hood, or if you know me in real life, you know that I LOVE Robin Hood! Well, for Christmas last year my in-laws bought us tickets for a Robin Hood musical this past May. Yes. A Robin Hood musical. It was as awesome as it sounds. The music was wonderful, the stunts were incredible, and the props and stage sets were breathtaking. The show was in French, but I was able to understand it for the most part (my husband didn’t understand it fully either; we had to ask our sister-in-law, who also attended, for some clarity afterwards). I know I called this show a musical, but it’s really called a spectacle, and it was rather different from musicals I’ve scene in the States. The main actors/singers did not participate in any of the main stunts or stage action. They basically stood at the front and sang to us, which was fine because they had beautiful voices. The premise of this spectacle is that Robin and Maid Marian spent one night together, and afterwards Marian left Sherwood, had a son, and then returned 15 years later to seek out Robin’s help when their son falls into trouble with the Sheriff of Nottingham. The best part of the show was the props and sets. Sherwood Forest looked so ethereal and fantastical. Everything was SO BEAUTIFUL. My favorite scene was when Robin Hood’s son and his romantic interest are sitting in the middle of a giant archery target during a musical number. 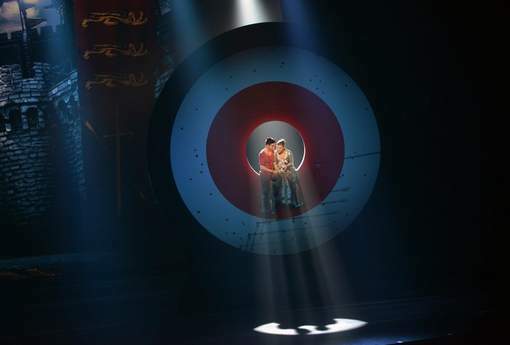 As she sings, the target slowly begins to turn and at the start of the bridge the background projection lights up and the whole stage is transformed to show the two lovers riding on horseback. It was so beautiful and well-done. The shows wrapped up in France over the summer, but this fall it was released in theaters over there and the DVD should be available soon if it isn’t out already. Both my sister-in-law and I are anxious to see it again! This musical also helped me cross off #16 on my list of 25 Things For My 25th Year! If you have a few minutes to spare, you enjoy listening to French music, and/or you love cool stunts and breakdancing, you should watch this video! “J’attendais” is one of my favorite songs from the soundtrack, and in this video you get to see all of the cast members on and behind the stage. 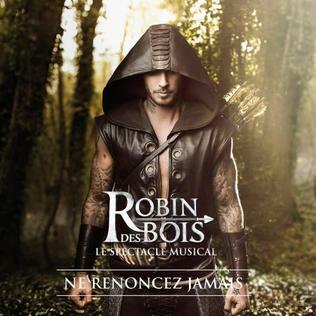 Oh wow I didn’t know there was a French musical based on Robin Hood! This sounds so exciting – I’m sad that the European brand of musicals doesn’t seem to have been embraced by American audiences with the whole spectacle aspect. I hope I’ll get to see a musical like this in Europe someday, although I hope to be familiar with the story already to understand what’s going on! 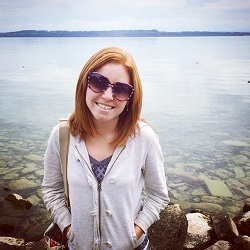 I listened to J’attendais and loved the pop sound! It was quite different but equally enjoyable! I’m glad you liked the song! The whole album is very pop sounding, not like our typical idea of musical theater.